1). Club member Tony Murphy will be doing a presentation on the building and use of a Moxen Vice. Robbie Young suggested that this would be a great piece of equipment when he was down for his presentation. He has built one and it has been a huge help in his shop. thanks to Tony for doing this. 2). Letter was received from the Motlow Foundation thanking us for all the support and help we gave during the fundraising event they held at the end of March. Lane Yoder the director writes that thanks to our efforts the raised nearly $50,000.00 this year to help students with tuition and books. They are very grateful for our help and look forward to a continued partnership with us. 3). Also as a reminder the Partners for Healing and Hands on Science Center events will be coming up in August and September so please be putting together something you would like to use to help with this important Community Service for our club. You can make a difference. 4). Thanks to all who signed up at the last meeting for the Building Project for Blue Monarch Women's home. We have done a preliminary design and will be visiting them this next week to get final approval so we can process a plan and divide up the work to get it completed. We will be building Modular Units in different shops that can be transported and put together with little time and fuss. More to follow when we are set to team up and build. 5). July will be our long-expected wood working seminar. We have secured Ronnie Young for 1/2 day on Saturday July 22nd. The event will be held at the Decherd Nazarene Church where we have our Christmas party. 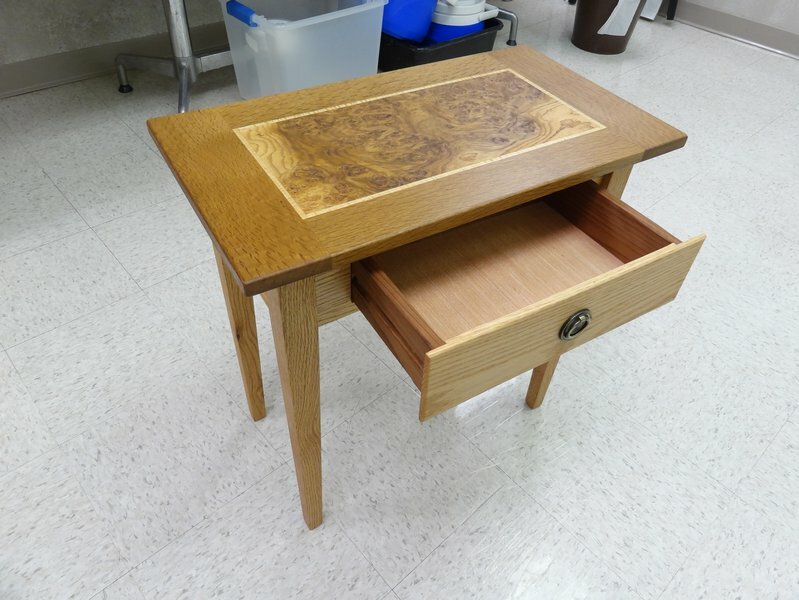 Ronnie will be building a great example of a jewelry box that everyone can enjoy doing. We choose this location for centralization and there is a huge space that accommodate a large amount if members comfortably. In talking to Ronnie, he will plan to begin at 8:00 AM with a couple of breaks and a lunch that will be provided at no cost to members. The event time is expected to run 5 to 6 hrs. which include lunch time. We are very excited to have Ronnie come and mentor us on a project we can all do in our shops with the tools we all have. PLEASE MARK YOUR CALENDARS FOR THIS EVENT. IT WILL BE THE SATURDAY AFTER OUR JULY MEETING. A SIGNUP SHEET WILL BE DISTRIBUTED AT THE JUNE MEETING SO WE CAN PLAN FOR LUNCH AND BREAK FOODS. Visitation will begin at 1:30 PM, with the memorial at 2:30 PM. Ruth (Mauruce's wife) will be having a sale of his shop equipment on July 8, beginning at 8 and going until 4. The address is 1966 Mansford Road, Winchester. This is close to Tim’s Ford State Park. He had an assortment of shop equipment & I did not get a list of items. I know that he had a couple of radial arm saws, a table saw, a jointer & a planer. People will just need to go and see what is being sold. Ruth is now living in an assisted-living complex in Tullahoma and sometime has difficulty hearing. Be sure to check out all the "up coming events" the executive committee has scheduled for the current year. Click here to view the "Event Schedule". REMINDER - Please remember to wear your name tag at our meetings so that our new members will know who you are. We will be purging the member listing soon, removing those members that have not paid their dues. Members can check with the club treasurer to see if they have paid. If you change phone number, email address, etc; please notify Chuck Taylor, membership chairman (931-728-7086 or taylor_cw@charter.net. This will allow the membership listing on the web site to reflect the current and up-to-date information of all our club members. The Club maintains a website, www.tnvalleywoodclug.org, which provides access to Club news between issues of Splinters and access to Forums exclusively for the use of TVW members. If you haven’t already registered for the Forum send an email to ackerman1@charter.net and I’ll register you. The current custodian is Pete Miller and he can be reached via e:mail at quackers1034@blomand.net. If you have any questions concerning the process of getting a CD please drop him an e:mail. We will hold the first seminar in late September. It will be taught by Blue Pau, a member of our Wood Club and the topic will be carving a half-scale mallard duck that could either be carved with modest detail as a decoy or with fine detail like most of Blue's bird carvings. The second seminar is planned for late January and will be taught by Adina Huckins, an accomplished Arkansas carver. Details about both seminars will be released soon in order to get attendance commitments from club members. 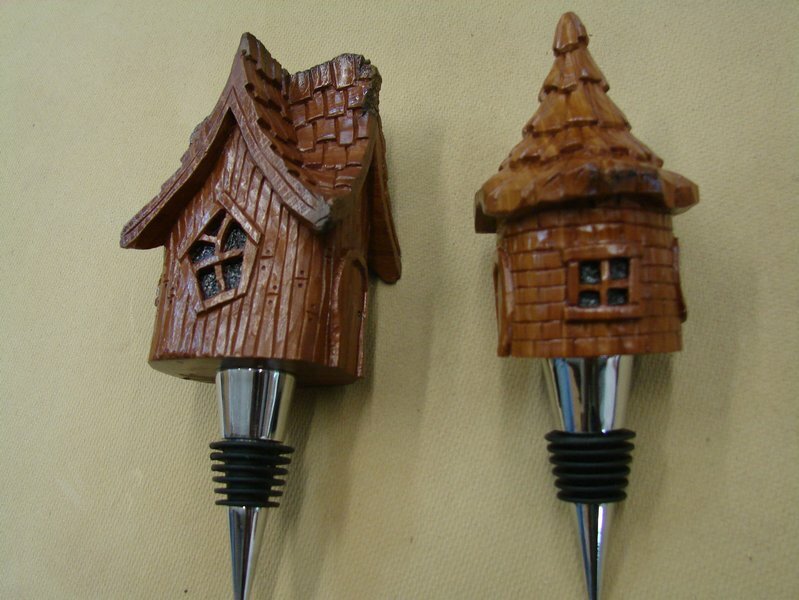 The attached photos are of recent Wood Club member carving projects. The carvers are continuing to meet twice a month on the first and third Saturday's of the month from 8:30 am to 10:30 am at at Jim Jolliffe's shop, located at Jolliffe Acres Lane, Tullahoma, TN. If you are a recent new member or had requested a new name tag, a box of name tags will be available at the next meeting. In the future, name tags will be made for new members and available for pickup at the next regular monthly meeting. Name tags for other members will be made upon request only and will also be available for pickup at the next meeting. Please contact Chuck Taylor (931-728-7086 or email taylor_cw@charter.net) for information or name tags. Greg Meyers brought a piece of intarsia. 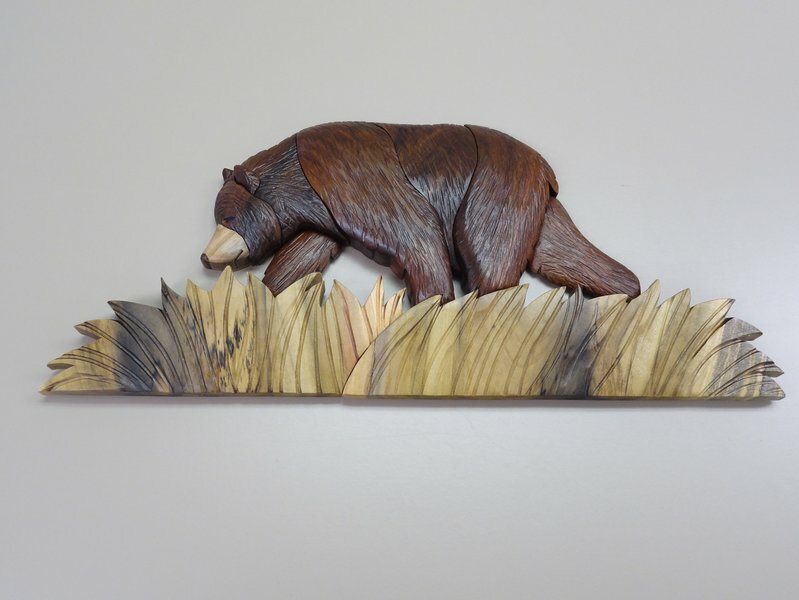 A bear he made at the Judy Gayle Roberts seminar. 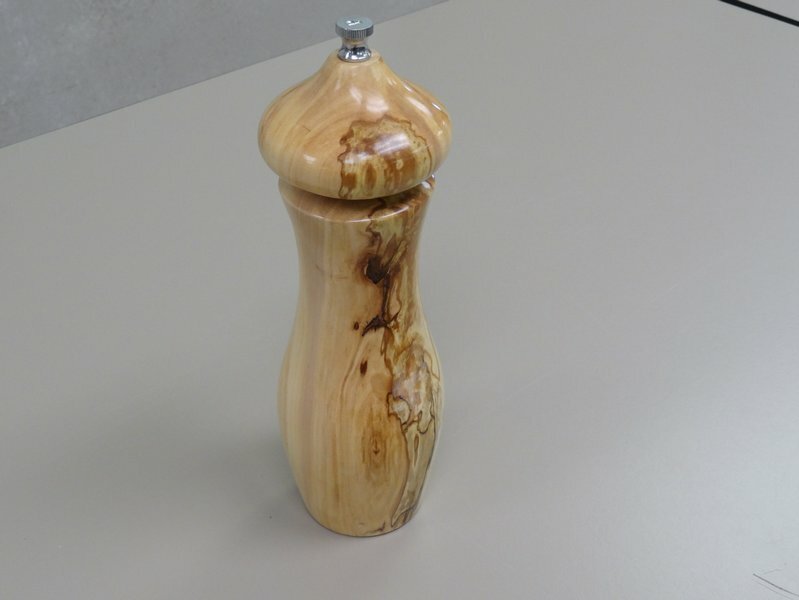 Karen Browning showed a peppermill made of apple wood from her Dad's farm. Finish lacquer. Ross Roepke had a really nice table he is making with the center of burl. 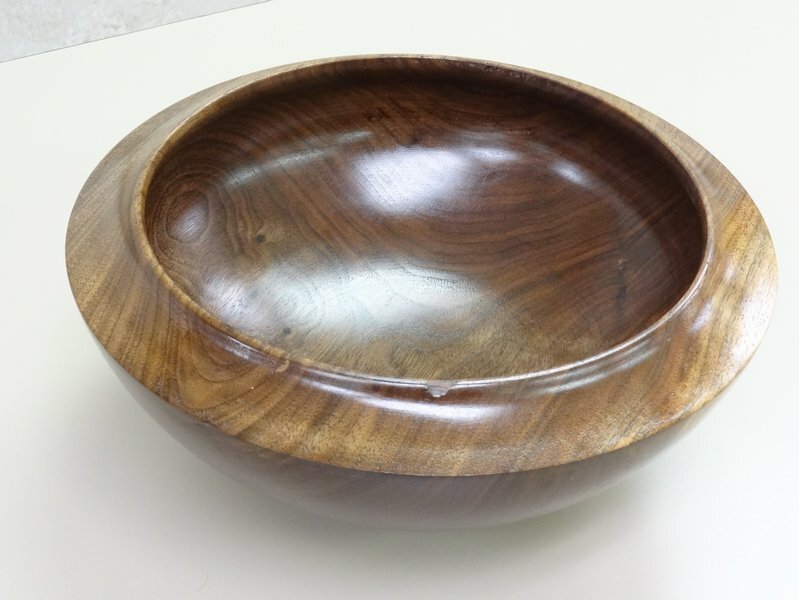 Bob Truesdale brought a bowl made from American Walnut. Finished with 5-6 coats tung oil. 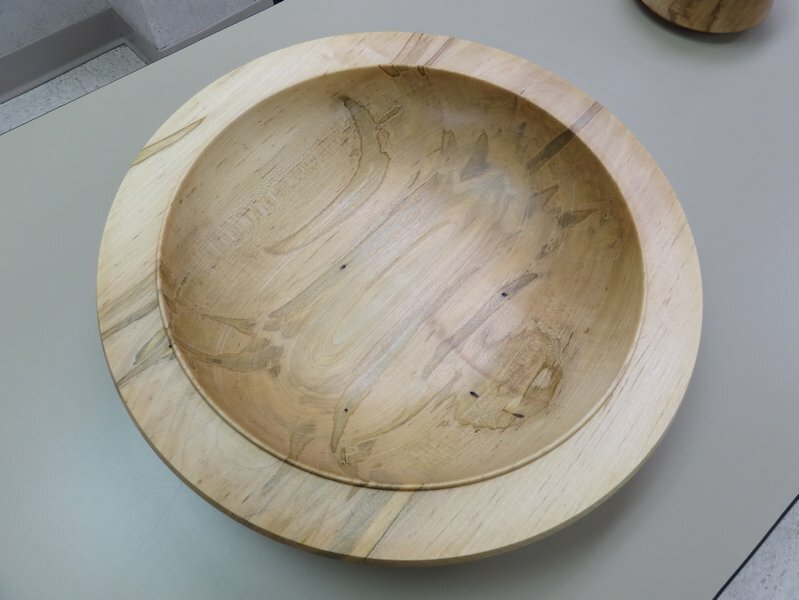 David Sapp had bowl made of Ambrosia Maple finished with Danish oil. 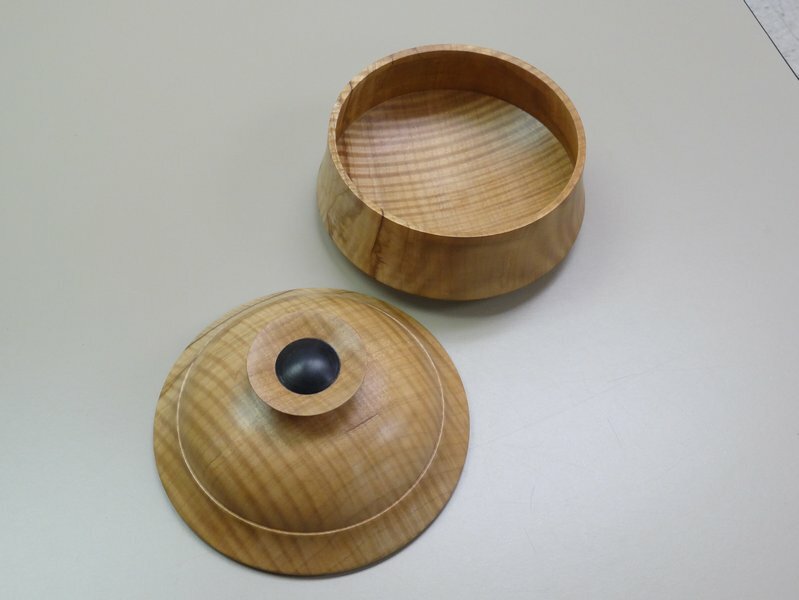 He also had a piece made from maple and has plug ebony finish. This was made at Arrowmont in Gatlinburg. Kenneth (Dale) Daniel will sharpen TVW member blades. His location is 2007 Ovoca Road, Tullahoma. Phone – 931-455-5024, cell – 931-247-4753. Jack Kincella has secured Builders Supply in Tullahoma as a new club sponsor and they will be giving all club members a 5% discount on ALL purchases in their store. This does not include the old Hawks hardware. All members need to do is show their name card and it is setup in the computer to get the discount.